It’s my birthday today so in a reverse of the norm I thought I’d do a wee ‘birthday present’ for my readers. Drip was an ogre, he hadn’t had much choice in that. 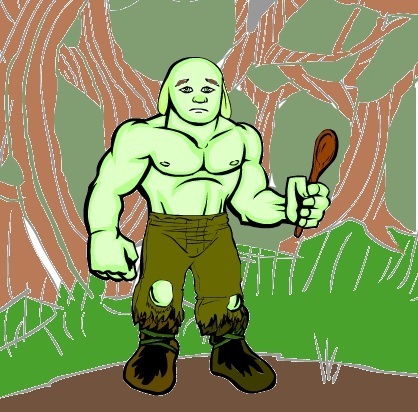 The people of the town of Dundrove didn’t care whether Drip wanted to be an ogre or not. It wasn’t always easy to understand what they were saying about him but Drip knew it wasn’t good. Drip was always a little sad. His eyes always had had a sort of shiny look and his nose seemed to run all the time. The local children (being children) called him ‘Drip’. They had been doing it for so long he couldn’t even remember his old name any more. Drip ran. He ran till his throat stung. He stopped high in the mountains, where he found a cave. Drip hid in that cave for a days. In fact he didn’t venture back to the road for a very long time. As months went by and the boys were nowhere to be found Drip got lonely enough to venture back down to the road more often. Eventually it became a daily routine. Drip would shuffle his greenish-white body down the hill from his cave every morning at dawn to sit at his ‘sitting rock’; a little place nestled in the woods where the trees gave him enough shelter for him to peak through the branches and watch the people that passed by. Drip still liked to be near people. The sound of their voices helped stop him from feeling so lonely. Months and years went by with Drip hiding in the forest, sitting on his rock, listening to the people laughing and talking as they walked or rode along the little forest road. On one particular morning though, Drip was not woken by the sound of birds but instead by a loud clinking and clunking noise from the woods below. Drip hauled himself up as fast as he could and shuffled his fastest shuffle down the well-worn path, only to find his sitting stone smashed to pieces. Standing beside it was a very shocked, very sweaty, old man holding a pickaxe. As soon as he saw the rage in the ogre’s eyes he lept for the road, untethered his horse from his big heavy cart, leapt on it’s back, and rode off at top speed. Drip was more angry than he had ever been in his life and before he knew what he was doing he picked up the old man’s cart and threw it up into a tree. It broke the top branches and crashed to the ground. Pieces of cart cascaded from the trees like giant wooden snowflakes. Drip was shocked at this, he wondered if they were going to put him in the dungeon or something. Drip didn’t want to fight the guardsmen, he had never hurt anyone in his life, so he nodded his big lumpy head and followed behind their horses. Drip ran. he had to get away from the horrible boys. Big men now. Big men with swords. Drip was sure they would lock him in the dungeons for ever. He could hear the men jumping off their horses to run after him and he tried to move even faster. Finally he reached a door that looked big enough even for him and leapt inside. The room behind was huge and smelled like sweet, juicy berries and of the bread and pastries that families sometimes ate at picnics out in the forest. Drip had really enjoyed hearing families playing and having fun from the comfort of his sitting rock, he started snuffling again at the thought of it lying in pieces. Drip had never been treated so nicely and nearly started crying again. Stopping himself, he pulled out a bench near the big table and sat down. The bench creaked loudly under Drip’s bulk and as he wiggled his bottom to get comfortable the bench gave up completely, collapsing into a heap of broken twigs. Drip had never cooked before, all of his meals had been things he found in the forest, and the closest he’s been to anything like Mrs Bunt’s big cooking fire was when he lit a small campfire outside his cave to keep him warm in the winter. He tried to explain that he didn’t know how to help but Mrs Bunt just marched him around the kitchen in the quickest tour of the place she had ever given. She wasn’t sure if Drip had followed any of it but she didn’t have much time before she needed to start work on the feast. Drip had taken it all in. The heat of the kitchen was doing something to his brain. 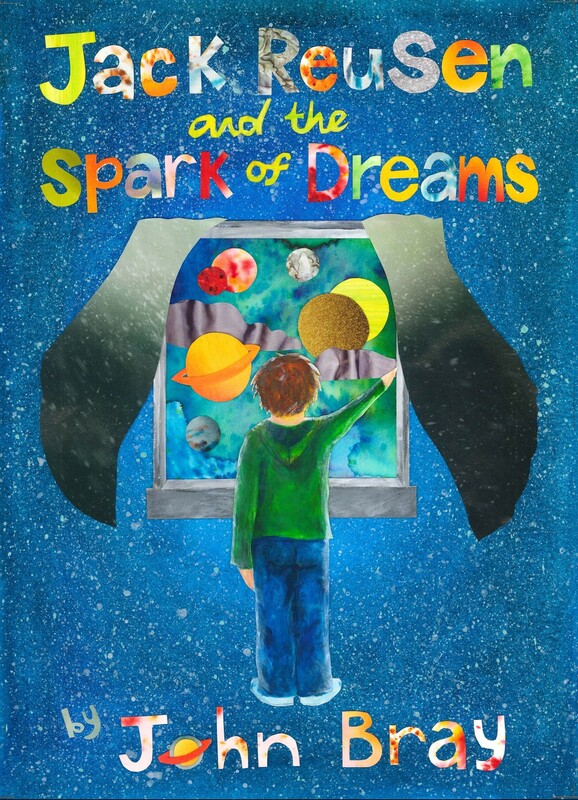 He was surprised at how quickly he understood what all of the different tools and utensils did and after he had cleared away the broken bench Drip popped on an apron, washed his hands thoroughly, and got to work. Drip was stirring a big pot of stew when the guards arrived at the kitchen door looking for him. Mrs Bunt was having none of their nonsense, Drip had told her what had happened so she told the guards to leave him alone. She explained that Drip would work in the kitchen to help pay for a replacement cart for the man in the forest. That was that. The guards were silent with shock. The idea of Drip ‘the bogey ogre’ cooking their meals made them sick. They thought that perhaps Mrs Bunt was joking but when they looked into the kitchen and saw Drip stirring the stew all they could think of was blubbering old Drip’s runny nose dripping into their dinner. Drip’s nose was clean and dry now but that didn’t stop the guards from making up their own minds. No one argued with Mrs Bunt though, she was strong enough to fight off any two guardsmen in the castle at once and, more importantly, she was in charge of what everyone ate. Nonetheless, the guards knew that they’d be giving the food at the feast a miss. That evening, after lots of entertainment from jugglers, dancers, and musicians, the people of the castle sat down to their feast. Lord Borrin and everyone else nodded with appreciation at the incredible food before them. People stopped talking as they dug into one of the best meals they had ever tasted but the small group of guardsmen didn’t notice any of that, pushing every plateful away. Mrs Bunt went down into the kitchen and grabbed Drip by the arm, leading him up the stairs to the great hall where a round of applause broke out. It was so loud it made his ears ring. 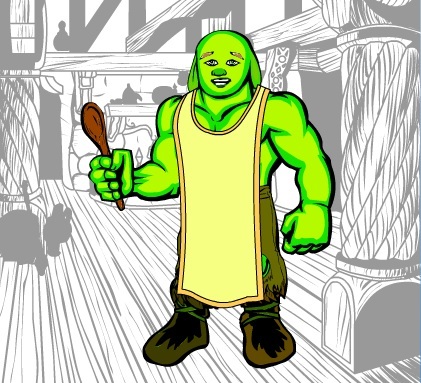 After just one day in the warmth of the castle kitchens, with a steady supply of food from Mrs Bunt, Drip looked like a completely different ogre. His clammy greenish-white skin was darker and greener, and he stood up straighter with not one tear or runny nose in sight. He was still Drip but he wasn’t so ‘drippy’ any more. The guardsmen suddenly realised what they’d missed out on and went to grab at their plates only to have them taken away by one of the maids. There wasn’t even a bread roll left for them to eat. They went back to their barracks that night with rumbling stomachs and the next morning some very, very sorry (and very hungry) guards went down into the kitchens to apologise to Drip for all the nasty things they had done when they were younger. They talked for a long time, and while they all found out about each other Drip cooked them the best omelettes ever. From that day on the guards always had breakfast with Drip, getting up before anyone else in the castle. They even got into the habit of sitting down at the fire with Drip while they all ate (Mrs Bunt still couldn’t find a bench strong enough to hold him). 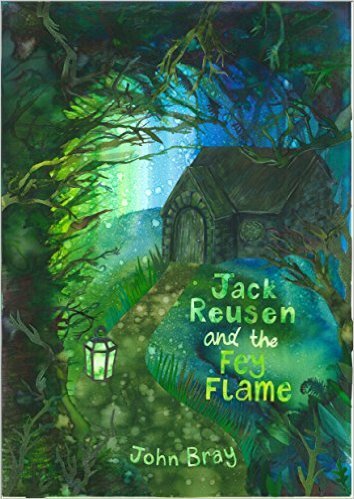 This entry was posted in Fey Stories, reading and literacy and tagged children's fantasy book, Children's fiction, early years chapter book, fantasy, imagination, independent author, Jack Reusen, jack reusen and the children of fate, jack reusen and the spark of dreams, john bray, scottish, scottish author, writing on 10 April, 2015 by John the Toy Shop Guy.